The Rugby World Cup hit the headlines for all the wrong reasons this week with tournament organisers under increasing pressure in the face of allegations of double standards. Not even an outstanding contest between Samoa and South Africa in North Harbour on Friday night could quell the disquiet surrounding the contrasting treatment of two of the tournament's major draw cards. England courted controversy last weekend by juggling balls during their woefully one-sided victory over Romania in Dunedin. On the face of it, their decision to substitute the ball before fly-half Jonny Wilkinson attempted a conversion may not appear such an inflammatory act but don't be fooled. England broke the Laws of the Game. Law 9.8.1 states the kicker must convert tries with same ball that was touched down, unless the referee agrees it is defective - England switched the ball on a number of occasions and not once raised a potential issue with referee Romain Poite. England were urged to 'desist' at half-time when their actions came to light and they did so but it is thought that their behaviour was still noted by the match commissioner. With an investigation by Rugby World Cup chiefs pending the Rugby Football Union were forced to act and were quick to carry out their own internal review. That potentially World Cup-derailing examination resulted in the admission that "management members took it upon themselves to substitute balls during the match in contravention of both the laws of the game and the spirit of the game." While the actions of those involved may not be shocking especially in a sport where multiple balls are used, surely there is no greater crime? Guilty of cheating by their own admission, the focus then switched to a suitable punishment. Fail to act with enough penance and risk the wrath of the rugby world, strike at the heart of their set-up and undermine a promising World Cup campaign. Someone had to pay for this indiscretion that was just the latest in a string of embarrassing incidents for the squad spanning a headline-grabbing night out in Queenstown, a suspension for lock Courtney Lawes and a warning over shoddy shirt numbers. Enter the fall guys - kicking coach Dave Alred and fitness coach Paul Stridgeon. The RFU's decision to offer up two members of the backroom team as the perpetrators behind may have been enough to appease World Cup officials who decided to take no further action but the knife did not go deeper enough for many within the rugby community. To suggest that fly-half Jonny Wilkinson was not in some way implicated by this dishonest deed is almost laughable and in this age of technology where even the 'water boy' wears a headset there can also be little doubt that the rest of the management team up in their box were also not aware of the events playing out down on the field. But there was next to no chance of Wilkinson, England's first-choice playmaker, being sacrificed or manager Martin Johnson pleading guilty to any charge. Johnson may have since accepted responsibility for the actions of his team but he did so safe in the knowledge that no further punishment was coming his way. The mud may have failed to stick to the England boss but the same could not be said for the reputation of English rugby. Still struggling to recover from what has been an eventful tournament to date, England invited further trouble with their attempts to pull a fast one. You question the need to adopt such a policy against a side that were always going to struggle to contain England - who ran in a total of 10 tries - and if the game had been closer or a quarter-final place had been on the line then rest assured that the stench emanating from the game would be significantly more pungent. It is clear to everyone that England escaped lightly but if they continue to push their luck you sense that will not always be the case. England's Teflon-like ability to ride out wave after wave of flak during this tournament has done little for their social media standing and that animosity only intensified in the wake of the harsh treatment of Samoa later in the week. "While you can understand the International Rugby Board's desire to protect the commercial value of their one main cash cow, their treatment of Samoa will win them few new friends as they look to develop the game." 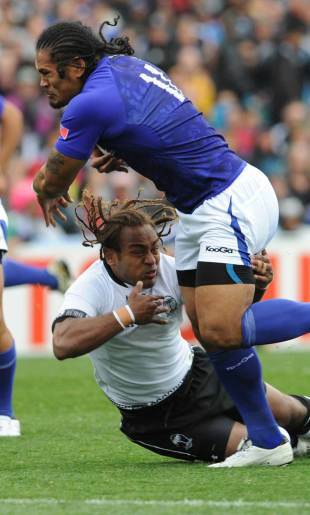 The World Cup authorities used the proverbial sledgehammer to crush a walnut by handing the Samoans a NZ$10,000 (£5,000) fine as punishment for winger Alesana Tuilagi's breach of sponsorship regulations. A union already struggling to compete due to a schedule and financial model that favours the sport's elite was being asked to cough up because one of their players wore a mouth guard that was not made by an official sponsor. And this, in the same week England escaped a fine of any sort for cheating. While you can understand the International Rugby Board's desire to protect the commercial value of their one main cash cow, their treatment of Samoa will win them few new friends as they look to develop the game. "Rugby World Cup Limited has proactively worked with participating unions to educate the key principles of the Rugby World Cup 2011 terms of participation," read the cold-hearted statement that defended their stance. The people of New Zealand, who have done so much to make this World Cup a success, refused to stand by and let their tournament be soured by such questionable bureaucracy. The quick-thinking John Campbell, host of the current affairs TV show Campbell Live, stepped in and organised a 'sausage sizzle' in Auckland that saw locals keen to help out pay up to £150 for a banger. Several thousand dollars was raised and along with a couple of other notable donations the fine was easily covered. That generosity may well have bailed out the Samoans but does not extend to the IRB who find themselves fighting fires on a number of fronts. New Zealand's 'threat' to pull out of the 2015 Rugby World Cup unless they are given a larger slice of the financial pie will of course not result in a tournament no-show but is still a bold negotiating ploy from the biggest commercial commodity in world rugby. The All Blacks would certainly leave a sizeable void should they not come to the party in England in four years times but their absence would pale into insignificance when compared to the potential hole left by millions of fans left disaffected by the sport's powerbrokers.